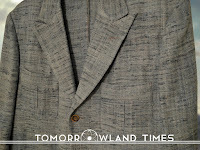 Take Home a Piece of the Movie with the Tomorrowland Times Anniversary Sale! 5/12/2016 09:47:00 PM By: Nick Be the first to comment! 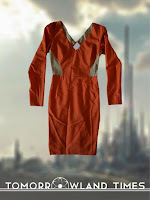 To celebrate the first anniversary of the theatrical release of Tomorrowland, I've decided to offer a selection of original production pieces from my personal collection. 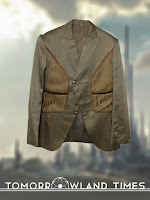 Over forty original production-made and screen-used items are now available for purchase as part of the Tomorrowland Times Anniversary Sale. All items were acquired from a prominent Hollywood costume shop who routinely stocks items from Walt Disney Pictures. They have all been matched to the film's production code, and many have been screen-matched. In addition to taking home a piece of the movie, every item sold helps to keep the lights on at Tomorrowland Times, the unofficial home for fans of Disney's Tomorrowland movie -- where Dreamers stick together. All items have been listed with the option of submitting an offer -- which I encourage you to do if an item interests you. All offers will be considered. I want to give as many of my fellow Dreamers as possible the chance to own a piece of the film they love. This is the first of many announcements we have planned for the first Tomorrow-versary, so stay tuned for more exciting updates!